Being able to swap out your spark plug at the side of the road can often get you out of trouble quickly so you can get home to make proper repairs. Not many other scooter brands can carry a spare wheel. This is one of the things making Vespas so unique and easy to use. A quick roadside tyre change and you can quickly be back on your way. This will get you into many areas on the scooter, the most important of which is likely to be adjusting the carburetor to prevent stalling or over revving. It will also come in handy in many other places. We usually recommend a relatively long stemmed version so that you can easily remove the carburetor cover to get to the jets which can be removed with a flat head screwdriver once the cover is off the carb. There are loads of places this gets used to tighten up things like brake levers and cables etc. Again, useful in loads of places when having to make on the road adjustments. These will help cover off many of other sized bolts on the bike or give you a way to grab hold on a slipped cable while you tighten things up. 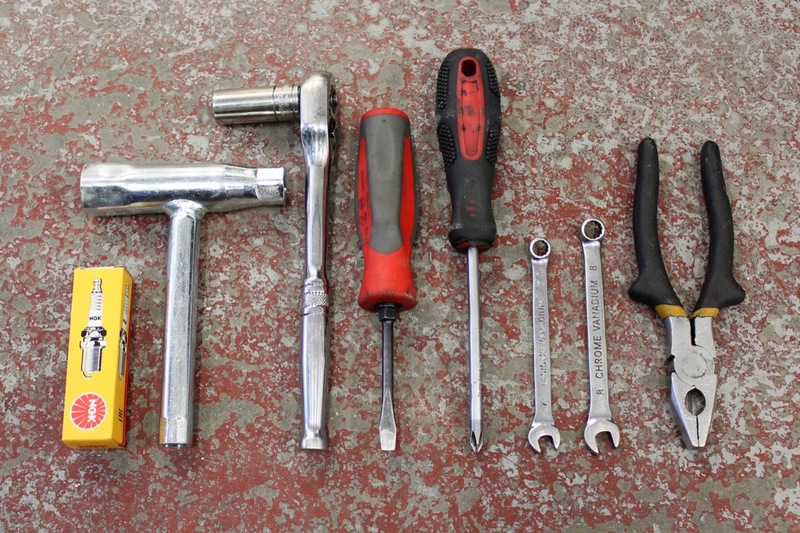 By no means is this a comprehensive maintenance kit with everything you’ll need to fix your scooter but this basic tool kit might just get you home. You may break down for a number of reasons: a fouled spark plug, a broken or loose cable, flat tyre or flooded carb. Whatever it is, a few general tools and a little knowledge will keep you going when others will simply be sat by the side of the road scratching their heads. You can always give us a call when needed and we can offer you some emergency advice to help out too.